Napoleon, left, was adopted by John and Judy in September 2000 when he was 7 weeks old. 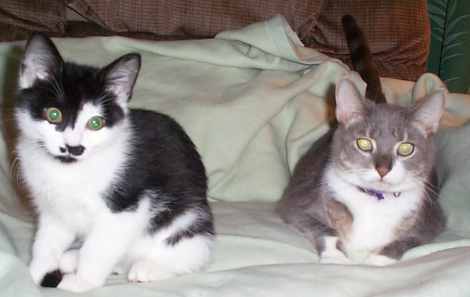 They write, "He is such a joy to have and gets along well with our five year old female cat Ash (right). We named him Napoleon because he tries to "rule" the house. We adopted Ash from the Humane Society and recommend agencies like Kitty Angels or Humane Society to everyone we know. Thank you KA for bringing him into our lives." 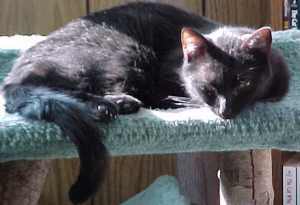 This is Opal, Midnight's sister, adopted by Allan, who writes, "Opal, as one can see, loves the sun. She is also into reading, as one may note from the titles in the upper bookshelf to her left. Opal is somewhat shy except to Alpha cat and senior cats, but the food tray removes all vestiges of aloofness, shyness and any other means of escape. I guess the stomach is the most forceful organ after all. Hmm! Opal gets along very well with Midnight and Scotty, and needless to say, Daddy, our senior cat. The females are less enthusiastic, not in an aggressive manner: she's one less extra helping! And of course, Lady Jane couldn't care less! Opal loves the garage and my ship models. She has already 'sunk' a carrier (I thought the Yorktown was sunk in the Battle of Midway). Exploring and sunbathing seem to be her favorite hobbies." Allan also adopted Dawn in January 2001. "Dawn is a toy cat who, we have discovered, loves toys, PLANTS and using molding as a scratch post. She gets along with all the community and loves to move all the bathroom carpets while playing with toys at 2 - 4 am. She has discovered the window seats built to capture the full sun and loves all of them. Feeding time is a problem: nobody else gets any. The 'senior' cats are advising her and 'seating arrangements' are being 'discussed' Ah the joys of youth! " Orson is an "Authentic American Dumpster" cat, having been rescued from a dump in northern Mass. Since he had apparently been on his own for a while, his social skills were less than perfect, but, he gets better and better everyday. Today, he enjoys life by relaxing in his safe, warm home, where there is plenty of good food to eat. 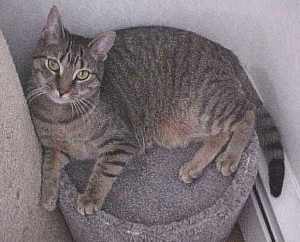 He became Patt and John's 15th Kitty Angel in January 1999, at the age of 2 years 3 months. 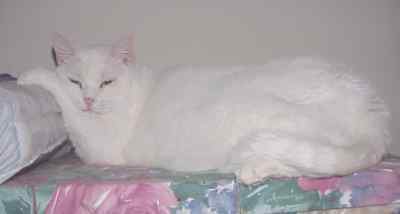 A sad postscript - Patt and John informed us that Orson passed away in March 2001, and wrote, "We miss our big, white boy and we will never forget him."